For those not familiar with Border Archery, these fine bows come from Scotland, with a long history in Bow making. 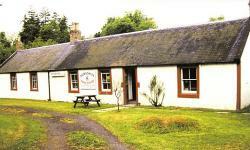 Border Archery has been making quality bows in Scotland since 1940. During that time the Company has had various names. As you can see Border Archery is not a new kid on the block. They have been in business for many years and are well known in the archery world both in Europe and North America. Today Border Archery is a modern company with 14 full time employees, and uses the latest in today’s technology to produce state of the art bows. Border Archery makes every effort to ensure that the exotic woods that they use are sourced from sustainable forestry practice. Sid and Ann Ball are the owners of Border archery, and will gladly work with you to make sure your bow is exactly what you want. The folks at Border have been busy in R&D ,developing some exciting new bows and limbs. We now have the D/R "Hawk" longbow,in a Hunter and Tournament version, as well as the HexV recurve program that has been aplied to the 1 piece recurves. There are ILF longbow limbs about to be introduced , A Black Douglas ILF version is now available also.I expect that in the very near future we will also see Metal Risers in ILF, coming out of the new CNC machine in the Border shop. Sid advises me they will soon have an updated website,with all the details.look for this early in the new year. The Border Hawk longbow is a new design for 2010. The Hawk was designed with the Bow Hunter in mind, who wants a modern R/D designed bow for hunting. The Hawk is available in shorter lengths, down to 60" , has a mild reflex Deflex design that is easy to string with or without a stringer. The Hawk is a very easy bow for me to like. The 62"Hawk I am reviewing has the optional Longbow pistol grip. We can have any style grip we wish, Howard Hill style, Locator, High, Medium, low, just ask when you make your order. Custom grips are available to suit your wishes. 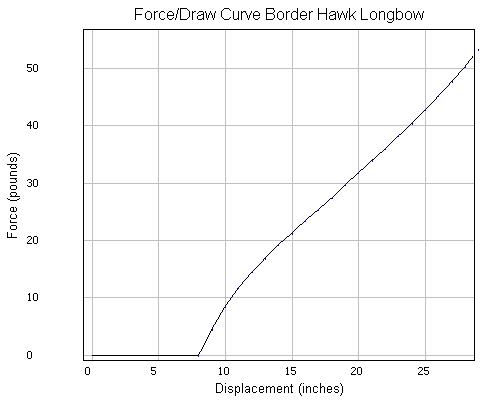 Border recommends the various Hawk bow length's of 60" to 66"for the draw length you have. These recommendations are made so you will have a reliable bow that does not stack at your draw length and will provide you with years of pleasant shooting. A 60" Hawk is made for a max draw of 28", the 62” is for 29", the 64” is for 30", and the 66" Hawk is designed for a max draw of 31". The DFC and Chrono table was done with a 6 5/8" brace height, and a 10 strand DF97 string. The first shots from the Hawk convinced me that this is a hunting bow. I quickly became friends with the Hawk, and a set of Heritage 90 carbon shafts, with 300-grain points that flew great, and hit the mark. It is quiet with just a set of Beaver silencers, and is very dead in the hand after the shot. I found it very easy to shoot well with, from the first few arrows. The hawk is a very lightweight bow to carry, and this is a good feature in a bow we will carry all day on a hunt. It does not require a heavy riser to tame shock and vibrations; it is just fine the way it is weighing in at a whopping 18.6 ounces complete and ready to hunt. I can carry this all day in the woods, and i certainly will be hunting with it. Drawing the Hawk is similar to many higher performing bows. It loads early and then pulls smooth to my anchor. The early draw weight is something I have come to like. It does give some shooters the feeling that it is a heavier than marked bow at first. This is typical with bows that have lots of pre load, however after the initial weight gain these bows draw smooth and evenly to our anchor without stacking. The Hawk is no exception to this, and bows with early draw weight gains typically have very good performance. The Hawk certainly has very good performance. I think Sid and Border have designed a very good shooting bow that has been designed to hunt. A hunting bow first is what was on the table when we first talked about the Hawk 2 years ago. It had to be a good performer, available in a shorter length, easy to string, provide excellent shooting qualities, and made with a hunter in mind. Performance was to be good or better, but second to shooting qualities if necessary. There is no second, it is a winner in both performance and shooting quality. One of the nice things with the hawk is the Vertical stability of the limb. It is solid at brace heights from 6 to 7", which is the recomended brace height range. Often R/D bows need a higher brace to obtain stability, however this is not the case with the Hawk. It is stable throught the entire range, and does not leave performance on the table from the need for higher brace heights. The limb construction on this Hawk uses a Golden Walnut core between 2 Maple laminations under Borders own layup of carbon fiber on both sides, without any glass .The Hawk is also available with other cores such as Borders Superflex composite neutral axis core or all Bamboo, or Bamboo sandwiching Golden Walnut. I am very happy with the lay up I have. The blue text below is from corespondence with Sid at Border Bows. Bow length recommended are 60" up to 27" 62" up to 28" 64" up to 29" and 66" up to 31" These take into account stress levels to some extent but more importantly stacking levels and string angles for smooth accurate and comfortable shooting. Since receiving the Hawk, it has been where it belongs, in the woods of Alberta hunting.I recently took the Hawk on a weeks hunting trip looking for the elusive Elk. The Elk did manage to stay safe, however a nice Mule Doe is now in the freezer thanks to the Hawk, and some good luck. During this holiday I took the Hawk to the woods on a lot of the outings , and after many days in the bush I have come to apreciate the Hawk for what it is. A hunting bow with great looks. The light physical weight makes it a natural for long walks, and the excellent performance allows me to have confidence with 50# without the need to strain against a heavy draw weight. Being able to come to draw in awkward positions is a nice benefit of a 50# bow as opposed to a heavier draw weight where we may struggle and possibly fail to be able to make a good shot. When I took this Doe the arrow cleanly passed thru both lungs and could not be found . I have no doubt that this 50# bow will easily take Moose or Elk for me if I do my part. Below is a message I received from Mike Willrich regarding the success and records set at Bonneville, USA, flight shooting championships with the Border Hawk Longbow. Well done Mike and Janice. This is an outstanding credit for a new model Hunting bow. The Hawk is the first bow from Border designed specificaly as a hunting bow. Border has not only hit the mark, but they also raised the bar with the Hawk. Unfortunately weighed in @ 51lb so had to take 1/2'' off arrows by hand & re shape with tools available, this ruined the balance point, so I think I would have shot much further !!! The Border Hawk Ameican Longbows are really nice bows to shoot with.